Winner, plus some other news! Commenter No. 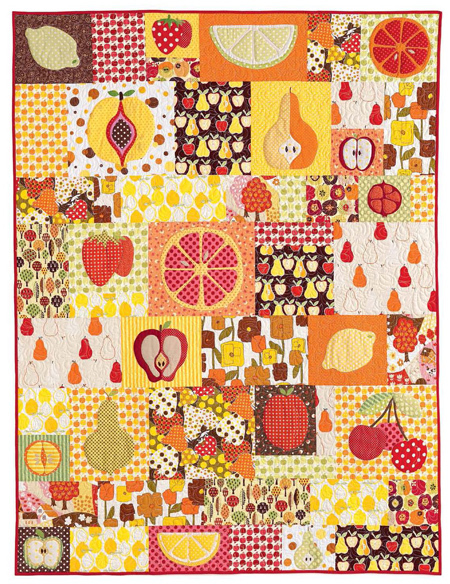 16, Karen Pastoor, came up the winner of The Quilter’s Appliqué Workshop. Congratulations Karen! I know you will enjoy this fabulous new book. And don’t forget that Kevin Kosbab is holding a blog tour later this week to celebrate the book’s release! It’ll go February 20-28 over at Kevin’s blog, Feed Dog Designs. In other news, I’m gearing up for my own guild’s quilt show this weekend! We’re the Pajaro Valley Quilt Association, with members from Santa Cruz County and beyond. The show is held at the County Fairgrounds in Watsonville. It’s a great location, we have all three buildings and there are lots of fun features and activities during the show. I’ll be in the Harvest Building this year, the same building where lunch is served and the quilt auction and fashion show are held. Hope to see you there this weekend! Saturday, February 22, 10-5, and Sunday, February 23, 10-4. I mentioned that I was working on a new pattern. Here it is, Sunday Dress. Back on the 1st with another great appliqué book! See you then! I’m subscribed to the appliqué book feed on Amazon, and as soon as I saw the announcement of a new book that was coming out, I was intrigued and followed the link right away. 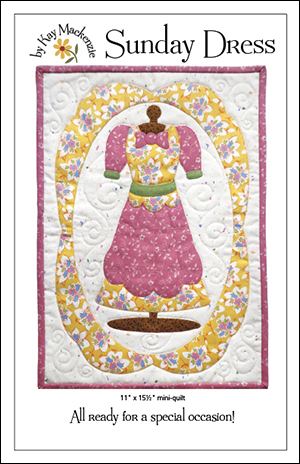 The Quilter’s Appliqué Workshop by Kevin Kosbab, from Interweave/F+W Media. I pulled up the “Look Inside” on Amazon, started reading the section on “Give Appliqué a Chance,”, and honestly, I got chills. Kevin and I could have one brain on the subject of appliqué hesitation. As you know I had just been working on The Appliqué Self-Help Brochure! I contacted Interweave to see if they would be willing to send a review copy. Not only were they quite gracious about doing so, they set up an interview with Kevin! I’m so happy to share our email conversation, a little later in the post. 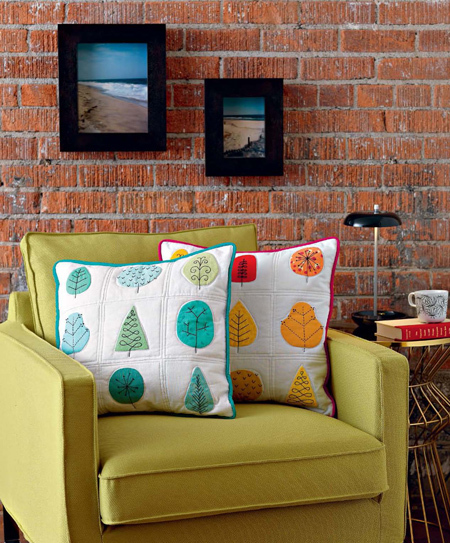 The Quilter’s Appliqué Workshop combines traditional methods with a fresh design eye. Kevin gently introduces and thoroughly explains several methods of hand and machine appliqué, including raw-edge, prepared-edge, and needle-turn, all presented with striking projects that fall toward the modern aesthetic. The old and the new… what a great combo platter! Here’s what Kevin and I talked about. • Kay: I love the front matter in your book… “Give Appliqué a Chance.” You and I both have heard what you aptly call “the old chestnuts,” such as “I don’t have the patience.” Me, in my booth at shows… how about you? • Kevin: There’s a healthy die-hard appliqué contingent at my local quilt guild, but other members are more hesitant to approach the “A-word”. Just attending quilt shows gives ample opportunity to overhear similar sentiments as people browse the vendors and displays. 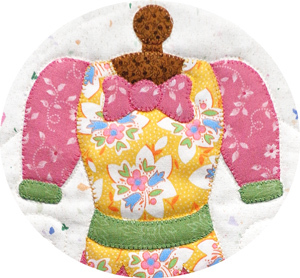 The most puzzling thing I’ve heard is, “I don’t appliqué, but I do fusible”–which, as you point out in your flier, IS appliqué! • Kay: You and I think alike when it comes to appliqué method. There are so many ways to go about it, and there’s no one correct way! I really like how you present this concept, both in the section called “Choosing a Method” and as each is introduced. Most books just announce the method, and plow right into it! You start out by asking “Why?” and then delivering an explanation of why one might choose that particular method. Is that the way your mind works? • Kevin: Definitely! High school calculus baffled me because nobody would (or could) explain the “why” of the processes, so I wanted to lay out actual reasons why one appliqué method might be beneficial in certain circumstances. Projects in the book like Eccentric Concentrics and the All Seasons Pillows take advantage of the freeform nature of needle-turn, while the crisp shapes of the Pineapple Rings and Counterbalance quilts make more sense as prepared-edge projects. And to define edges with decorative stitching or contrasting thread, you can’t beat raw-edge fusible appliqué. I really believe there’s no one-size-fits-all method, and each offers unique opportunities and challenges. • Kay: The subtitle of the book is “Timeless Techniques for Modern Designs.” Its seems to act as a bridge between what’s time-honored and what’s coming up new and fresh in quilting today. Was that your thinking going into the project? • Kevin: It was definitely one of the thoughts floating around in my head–in a wider sense, that’s how I like to approach quilting and needlework in general, learning from the experience of people before me while applying those skills to a newer aesthetic. I love digging through old needlework books and figuring out how to extract the basic techniques from the often dated examples. • Kay: The book gives information on very precise ways to achieve results, and also more freeform strategies. I appreciate the way you encourage imprecision and improvisation in appliqué. • Kevin: I’m so glad to hear that. I think concentration on precision is one of the biggest barriers to enjoyment of appliqué, so I wanted to counter that with a different perspective. There’s been lots of interest in improvisational piecing over the last several years, and it felt to me that improvisation was an even more natural component of appliqué, even though it’s not an aspect I often see associated with appliqué (or encouraged). Historical quilts are rarely absolutely precise, but they have a vitality that’s lost when we try too hard to emulate computer-aided perfection. Improvisation shouldn’t be about shoddy craftsmanship, but about embracing the handmade nature of the things we are taking the time to make by hand. • Kay: The sidebar on “Quilt Police, Appliqué Division” had me cracking up! I’ll just quote the first couple of sentences. “Every branch of quilting has its share of self-appointed authoritarians on a mission to ensure compliance with their version of The Right Way To Do Things. Appliqué seems to attract an especially large police force, but as in real law enforcement, their statutes vary by jurisdiction.” Well said! • Kevin: Thanks, I had fun writing it! Writing pages and pages of detailed technical instructions can provoke occasional outbursts like that. 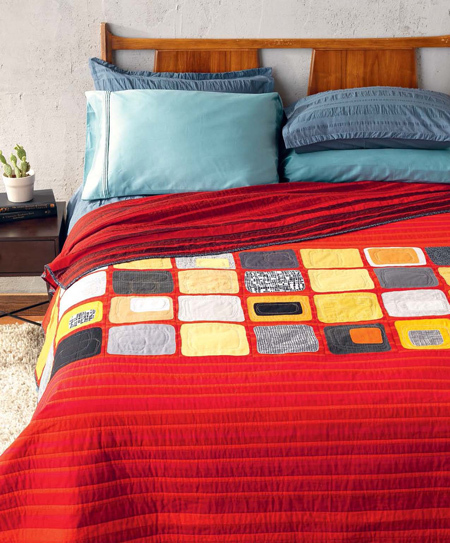 ;-) And besides, who said quilting had to be all serious business? • Kay: You talk about how when you first became interested in appliqué, there were calls to mom. Can you describe how those calls went? She’s an expert appliquér, so since she was my main point of quilting contact then, she didn’t instill any of the fear many quilters feel about appliqué. She encouraged me to try a freezer paper and starch-turned method to start with and gave me a basic run-down of how it worked, and I set off to do a large-scale appliqué across the better part of a full-size bed quilt–not how I’d recommend starting, but it got me hooked. After I’d done a couple quilts that way, I lamented to my mom how the starching and ironing started to feel tedious, a feeling she shared (neither of us get our kicks from ironing laundry), so she promised to show me needle-turn applique the next time we got together in person. The rest of my family couldn’t believe the sight of the two of us messing about with fabric and needles, but since then my younger brother’s also become a costume designer, so my father and other brother (both engineers) really wonder what happened. My mom also gave lots of advice on tools and supplies, though what I had available at the time was pretty much limited to what was available on foot in downtown Philadelphia (which meant hand-quilting thread for appliqué–again, not what I’d recommend for a beginner!). We still compare notes on new supplies, techniques, and ideas. Though our quilts look totally different, our attitudes about quilting are pretty close, so she’s been very generous in helping me out with pattern samples. Call me a mamma’s boy if you must, but we do live thousands miles apart! • Kay: The book has full-size patterns in a plastic bag attached to the inside back cover! Excellent! Was that your concept? • Kevin: The publisher decided the ultimate format, but I felt strongly that the patterns should be printed full size. It’s so frustrating when a book requires patterns to be enlarged–it always seems to take a huge amount of trial and error to get the photocopies to come out right. If people have bought the book, they shouldn’t have to pay a copy shop too. That said, I did have to work out an enlargement percentage for the Eccentric Concentrics Quilt in the book because the pattern is the size of the entire quilt, but I hope people will prefer to sketch out their own interpretation. • Kay: How did you and Interweave get together? • Kevin: I’ve been designing sewing projects for Stitch, one of Interweave’s magazines, since their second issue, so that’s how their books division found me. The acquisitions editor asked if I’d thought about writing a book, to which I replied, “As a matter of fact, yes!” I’d worked as a book editor myself, so a quilting book had been knocking around in my head for a while. • Kay: When, why, and how did you become interested in quilting and appliqué? Do you teach classes? How do we pronounce your last name? • Kevin: Still with neither of us thinking I’d get into quilting, my mom bought me my first sewing machine when I started talking about making curtains for my first apartment. That apartment never had its curtains finished, though, because I soon got distracted with quilting: I made a really simple quilt for my bed from Denyse Schmidt‘s first book, then another bed quilt from Weeks Ringle and Bill Kerr‘s book shortly after, and then I started designing my own patterns. I actually picked up appliqué shortly after those first two quilts, encouraged by my enjoyment of binding. I’d never planned to get into quilting, but it gave a medium to my lifelong interest in graphic design–appliqué was the last piece of the puzzle, opening up infinite possibilities in designing quilts. I do teach classes, including some new ones based on the improvisational approaches in my book. Confirmed teaching engagements are posted on my website on the Class Schedule page. My last name has been mispronounced in lots of ways over the years, but per the U.S. Air Force it’s KOZ-bab, just like it’s spelled but with a Z sound instead of an S. It previously had a more Germanic pronunciation, but my grandfather decided his name was whatever his superiors called him, so that’s what we’ve been running with since. Thanks for your kind words and thoughtful questions. It’s hugely rewarding to hear that someone “gets it” after all the work of putting the book together. • Kay: I get it! Been going there and doing that! You did a great job. Kevin’s putting together a blog tour to celebrate the upcoming release of his book! It’ll be going on February 20-28 over on Kevin’s blog, Feed Dog Designs. Be sure to mark your calendars! 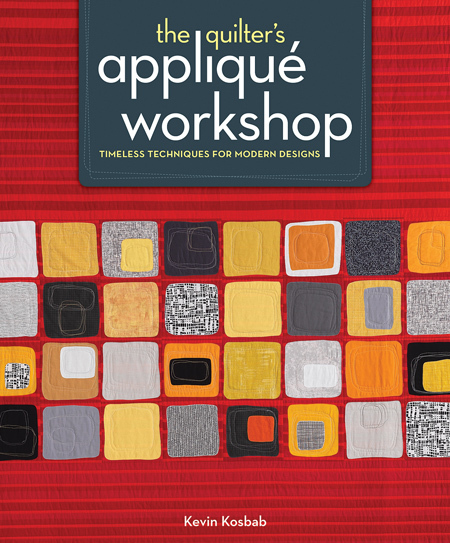 In the meantime, I have a copy of The Quilter’s Appliqué Workshop to give away here! If you’d like to enter my drawing, leave a comment here on the blog before 7:00 p.m. on Monday, February 17. Open to U.S. and Canada mailing addresses only. And remember, step away from the “reply” button if you’re getting this by email. Come to the blog itself to leave your comment. Thanks Kevin for taking the time to share some inside info with us! Just a couple quick notes today. You may be wondering what happened to our book feature for February. It’s coming! Stay tuned for something really cool, a little later in the month. 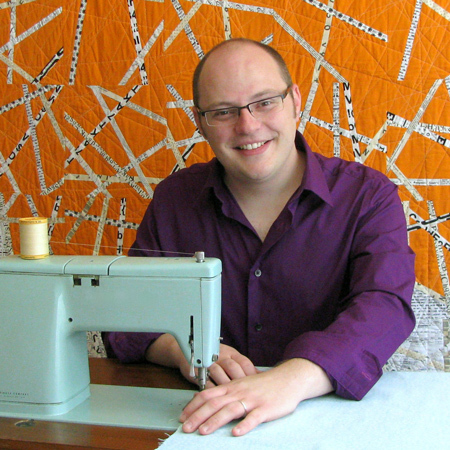 I’m headed to the Folsom Quilt and Fiber Guild show this weekend. It’ll be my first time, and from what I understand it’s a pretty big and wonderful show. I’m looking forward to it! I saw my buddy Cathy of Cathy’s Crafts at Road, and it turns out we’ll be next-door neighbors, yay! I made a new pattern! It has this in it. I’ll show you the whole thing later. 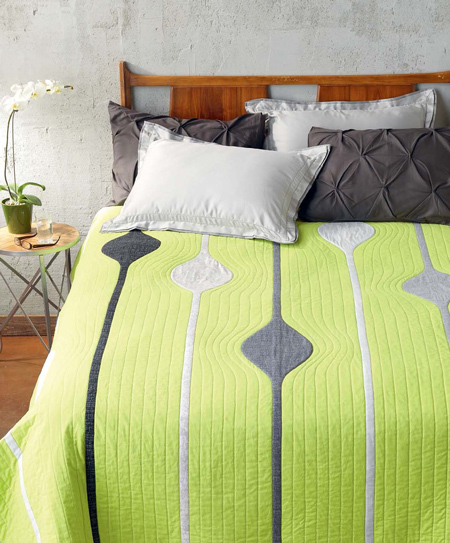 There’s a giveaway going on right now at Quiltmaker. It ends February 8, so hurry on over!